First Choice… Made in America! If you go online and poke around a bit, you’ll find what undeniably appears to be a growing interest in buying American manufactured goods. It’s all over the web and now it’s even being featured on network television with ABC’s Diane Sawyer and David Muir championing the cause. This started before I posted my first blog on the subject, “On PURPOSE…,” both here and on Advantstar’s, http://workshop.search-autoparts.com site, a few weeks ago. “On PURPOSE…” was a simple attempt to let people know there was more to follow. The “more to follow” was a second blog post, “Made Where?” followed by a third, “Idea On Fire,” that was prompted by the garment factory fire in Dhaka, Bangladesh. This is a big idea and big ideas are scary, especially when they arrive well ahead of the paradigm shift. I know that from personal experience. I’ve had to pull more than a few arrows out of my back and even though the arrows are an occupational hazard: an integral part of being a pioneer, they are still painful and damned uncomfortable! But, think about it for a minute, if there were no rewards no one would ever leave their comfort zone. No one would go anywhere without a safety net in place to catch them when they lost their footing. Over the years, I’ve learned the only safety net I need is you. You’ve been there to catch me when I stumble and that’s all I’ve ever needed to know. So, we’re boldly going where no one has ever gone before: at least not in our industry, with a program we’re calling First Choice… Made in America! The response to the blogs has been overwhelmingly positive. Everyone who has responded is more interested in how to make it work than in telling me how or why it won’t. That’s more encouraging than you can imagine because we are headed into uncharted territory where there is bound to be lot more, “Well, we’ll just have to figure it out as we go along…” than anyone could possibly be comfortable with. The ‘good news’ is, we’ve had “to figure it out as we go along” in the past and lived to tell about! So here’s what we are planning to do. We’re already working on a list of all the companies manufacturing goods within the United States for the Aftermarket: that is all companies employing American factory workers in facilities here in the United States. We will be asking our distribution and manufacturing partners to help us indicate which parts are Made in America (Or, assembled here) by identifying them with an easily recognizable icon. 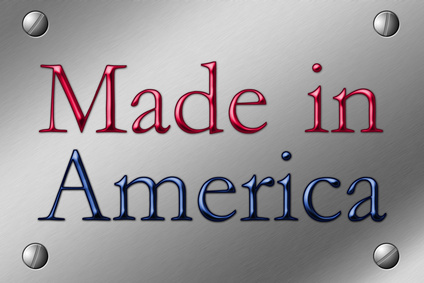 Made in America – Manufactured within the borders of the United States by American factory workers; Made in America – Assembled within the borders of the United States by American factory workers; Made in the Northern Hemisphere – manufactured in Canada or Mexico by branded, recognized, aftermarket companies, etc. If you’re wondering why I haven’t specified “manufactured by an American company,” it’s because I don’t care whether it was an American company with operations all over the globe or a multi-national corporation, like a Bosch or a Denso, who are just as committed to manufacturing world class quality products in factories here in the United States. All I care about is where that production line is and who is drawing that paycheck! I will be asking our manufacturing and distribution partners to do whatever they can to reduce the cost of delivering those Made in America parts to you and me. I will do whatever I can to match whatever savings they are able to offer… or, get as close as I can. And, I will be encouraging you to do the same. Then, I’ll pass those savings along to the motorist. Anything we can do to reduce the cost of that American-made part to the consumer reduces the price differential the vehicle owner can both see and feel between parts made here and their less expensive, offshore alternatives. Right now, these are just ideas: mental constructs. A response to the interminable problems we’ve all been facing throughout the endless recession and recovery. They will remain nothing more or less than ideas until someone does something with them: unless or until they are embraced and then implemented. These ideas need you… Please don’t underestimate their power or the opportunity you have to make a difference: the power you have to make this work. If you are a shop owner, give this idea a chance. Talk to your customers about it. Help make them aware of the critical difference supporting products, companies and jobs here in this country can make. Help them understand the benefits. Help them recognize the value. Help minimize the potential difference in cost. Make parts manufactured here in the United States your First Choice. If you’re a Tech, bring this idea to your manager or owner. Encourage them to give this important idea a chance for all the reasons mentioned above. If that doesn’t work remind them the job they save just might be yours – but the company they save most assuredly will be their own! If they don’t get it, let me know and I’ll try. Couple that passionate commitment with attainable goals, no matter how unrealistic or unreasonable, and you will find yourself confronted with a source of energy as powerful and formidable as any force of nature. Afford that individual a platform and changing the world suddenly seems a little more plausible. When it comes to “First Choice… Made in America!” I am that individual and I’m hoping you will join me! Are you willing to become a part of the solution and make the choice: the choice to join the growing First Choice… Made in America! army?